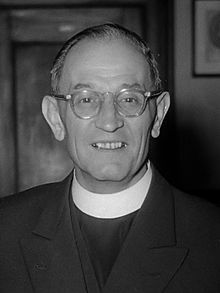 Friedrich Gustav Emil Martin Niemöller (14 January 1892 – 6 March 1984) was a Protestant pastor and social activist. We must openly declare that we are not innocent of the Nazi murders, of the murder of German communists, Poles, Jews, and the people in German-occupied countries. I returned home after eight years' imprisonment as a completely different person. I am now convinced that the Reformation of the church will come from the east. Twenty-five years later Niemöller indicated that this was the version he preferred, in a 1971 interview. In Erlangen, for instance, in January 1946 he spoke of meeting a German Jew who had lost everything — parents, brothers, and sisters too. 'I could not help myself', said Niemöller, 'I had to tell him, "Dear brother, fellow man, Jew, before you say anything, I say to you: I acknowledge my guilt and beg you to forgive me and my people for this sin."' Niemöller's stance was by no means entirely welcome to the 1,200 students to whom he was preaching. They shouted and jeered as he preached that Germany must accept responsibility for the five or six million murdered Jews. Students in Marburg and Göttingen similarly heckled him. But Niemöller insisted that "We must openly declare that we are not innocent of the Nazi murders, of the murder of German communists, Poles, Jews, and the people in German-occupied countries. No doubt others made mistakes too, but the wave of crime started here and here it reached its highest peak. The guilt exists, there is no doubt about that — even if there were no other guilt than that of the six million clay urns containing the ashes of incinerated Jews from all over Europe. And this guilt lies heavily upon the German people and the German name, even upon Christendom. For in our world and in our name have these things been done." He called on the people to show a sense of responsibility towards their fellow-men, he abjured them not to forget the lessons of the past and, above all, he reminded them constantly of the burden of guilt which had to be redeemed before a new life could begin. In so doing he was at pains not to exclude himself from a like responsibility, and told in this connexion the story of the visit which he and his wife paid to Dachau in the autumn of 1945. "After showing her the cell in which he had been confined for so many months, they passed the crematorium. A great white-painted board had been affixed to a tree and on it, in black letters, they read: "Here between the years 1933 and 1945 238,756 human beings were incinerated." At that moment, Niemoller told his audience, the consciousness of his own guilt and his own failure assailed him as never before. "And God asked me — as once He asked the First Man after the Fall, Adam — Man, where wast thou in those years 1933 to 1945? I knew I had no answer to that question. True, I had an alibi in my pocket, for the years 1937 to 1945, my identity disc from the concentration camp. But what help to me was that? God was not asking me where I had been from 1937 to 1945, but from 1933 to 1945, and for the years 1933 to 1937 I had no answer. Should I have said perhaps: 'As a pastor in those years I bore courageous witness to the Faith; I dared to speak, and risked life and freedom in doing so?' But God did not ask about that. God asked: 'Where were you from 1933 to 1945 when human beings were incinerated here? When, in 1933, Goering publicly boasted that all active Communists had been imprisoned and rendered harmless — that was when we forgot our responsibility, that was when we should have warned our parishioners. Many a man from my own parish, who went and joined the National Socialist Party and who is now to do penance for his act, could rise up against me today and say that he would have acted differently if I had not kept silence at that time. … I know that I made my contribution towards the enslavement of the German people. He was soon to experience a terrible disillusionment. … By the beginning of 1934, the disillusioned Pastor Niemoeller had become the guiding spirit of the minority resistance in both the "Confessional Church" and the Pastor's Emergency League. More information on Niemöller's most famous statement presented by Harold Marcuse, Ph.D., at UC Santa Barbara. This page was last edited on 2 January 2018, at 23:18.